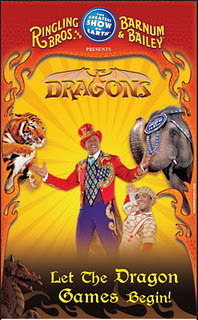 Acting Balanced: W!N 4 Tickets to Ringling Brothers Dragons Show in Greenville, SC! W!N 4 Tickets to Ringling Brothers Dragons Show in Greenville, SC! The GREATEST show on Earth has a new show "hatching" soon!! Watch this sneak peek video and get ready! The Ringling Bros. Barnum & Bailey circus is coming to the BI-LO Center in Greenville, SC on February 1-5th! Tickets are on sale now! The Ringling Bros and Barnum Bailey support local families and education by their Reading with Ringling program! In many libraries around the country, the children can earn free tickets to see the circus by reading books! Check to see if your library is participating! The Greenville libraries are! Okay on to the really good part.......FREE TICKETS!! We are giving away a family 4 pack to the circus at the Bilo Center! WIN IT: Family 4 pack!! Thank you to the following blogs for your help in promoting this event: Mama to 4 Blessings, The Three Under, Acting Balanced, I'd Rather be Changing Diapers, JDaniel4's Mom, Coupon Savings in the South,and The Mommy Times.